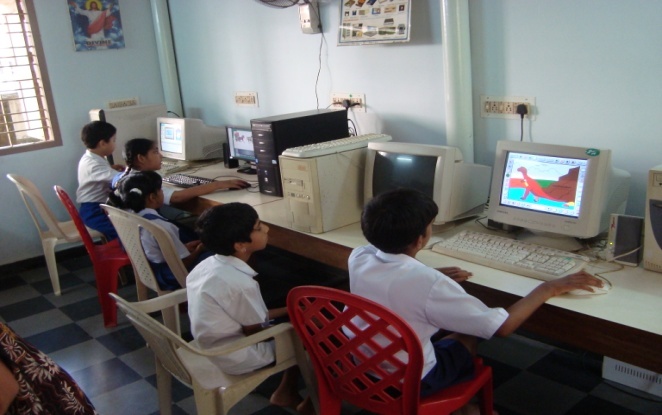 Computer Lab : St. Agnes Special School computer training centre started in the year 2000. It was constructed with the generous donations of Kuwait Canara Welfare Association Kuwait in order to help the children with special needs. At present around 50 to 60 children are benefitting from this. We have regular computer teacher who trains the children according to their ability. Children learn to match the items, colour the given object , story building, fill in the blank word etc. Library : We have a well equipped Library having around one thousand books pertaining only to disability area. We also have newspapers and magazines that highlight the news and events of Children with disabilities. Though our students cannot have access to our library, the teachers make use of it for various ways. -The physiotherapy, speech therapy, students visit regularly to our school to give physiotherapy and speech therapy. They come from Sri Devi College, Mangalore, Dr M.V.Shetty College Mangalore,Karavali college manglore, Fr Muller college Mangalore. etc. -They conduct various camps in different sitting. -The MSW students from Srinivas College conducted a Medical camp which was benefited by our students. -The MSW students of DrM.V.Shetty College conducted a camp to findout the blood group of our students.About 200 students blood group was detected that day. -The MSW students of the same college also conducts sibling meeting every year. -They have also started the self-help groups for the parents of our students where one group of women meet every fortnight for the meeting. -The MSW students accompany our students to the doctor and other places and help in various other activities. -They also give programmes on teachers day as well as children’s day and give Joy to them.